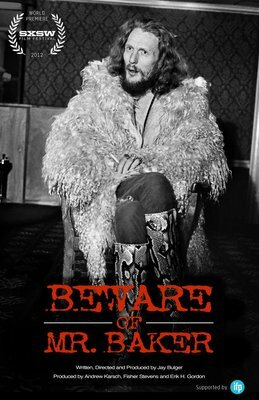 Arguably best known for beating the skins in the seminal heavy rock trio, Cream, the wild-eyed, red bushy- haired Ginger Baker is quite the character, and more than just a madman drummer, as is revealed in Jay Bulger’s documentary Beware Of Mr. Baker. The title of this film comes from a sign fronting Baker’s Africa compound, and one really should beware of the guy (at the end of this film Baker hits the director on the nose with his cane! ); Baker has had homes in his U.K. birthplace, America, Italy and Africa. While a comprehensive documentary like this is about the music-and the footage of Baker’s various live playing throughout his career is thrilling to see-it’s also the anecdotes from Baker’s own mouth that are so compelling. He relates honestly about growing-up, finding his love for jazz drumming (and his love for his idols in it), making his way in the rock and roll scene of the 60’s, finding a love for African rhythms, forming Cream, playing with Fela Kuti in 1972, battling heroin, finding Polo to be almost as important as drumming and leaving 3 wives and 3 children. There’s interviews here from famous friends like Eric Clapton, fellow drummers Charlie Watts and Lars Ulrich and Baker’s grown son, quite a good drummer himself and currently estranged from his dad, but nobody knows Ginger Baker really. This is just a very talented yet tortured 73 year old who wants to live life to the beat of his own drummer. Beware of Mr. Baker opens in select theaters November 28.